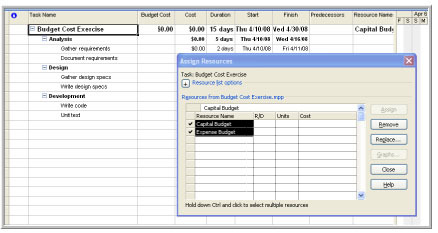 There is a new feature in Project 2007 that enables you to track budgets at the project level. This is a powerful new feature enabling you to track your cost forecast and (eventually) your actual cost against that original project budget. This article will explain how to set up a project budget. The first thing that needs to be done is to determine the various ‘buckets’ of project budget you want to track. In this example, we will track Capital and Expense budgets. To do so, add those items as Resources on the Resource Sheet view as shown below. Indicate that the Resource is of Type ‘Cost’, and indicate a ‘Yes’ in the ‘Budget’ field. These two parameters indicate this is a Budget Cost resource. Now that these Budget Cost resources are set up in the Resource Sheet view, assign them to the project. In order to do this, navigate to your Gantt Chart view. Make sure that the option “Show Project Summary Task’ is checked on the View tab under Tools, Options. This makes sure that a top-line project task appears on your project plan. Now that you have assigned the Budget Cost resources to the project, take the final step to actually allocate the budgeted cost itself. Intuitively, you should be able to do that through the step indicated above by just entering a value into the Cost field. However, it’s not that simple! The next step is somewhat tricky and hard to remember. What you need to do is navigate to the Task Usage view and expose the ‘Budget Cost’ column (in fact, if this is something you frequently do, you may consider creating a custom view that already has this column in it). If you now navigate back to the Gantt Chart view, and expose the Budget Cost field, you will see the rolled up budget for this project. skilled photographer and photographic post-processor. His knowledge shines through despite the impediments presented by the book's truly awful design. Keep up to great work on it. Thank you. Nice explanation but I still have some problems to track budges, please give me a more detailed tutorial. Keep focusing in your post. I adore how we are able to all communicate our feelings. this can be an very good article here. Thank you...we'll be following this guide TODAY and it's the best summary I've seen online so far. As with the preprinted checks, you can use this money any way you want. Keep us posted on the next please. Budgeting is deeply needed for the records of the whole system.